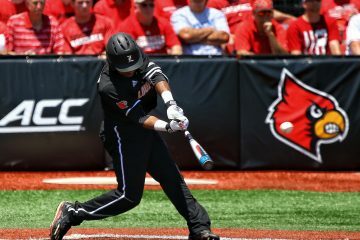 On the heels of having their best offensive output of the season in their series against NC State, the #7 Louisville Cardinals (29-8, 13-5) somehow found a way to be even better at the plate. 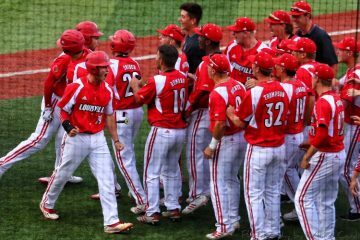 After taking an early 5-1 deficit, the Cardinal Nine went on a 17-1 run to absolutely throttle the Kentucky Wildcats (20-17) to the tune of 18-6 on their home diamond and sweep the season Battle of the Bluegrass series. Their 18 runs are the most against Kentucky since a 23-15 against the Cats on April 22, 1976. Jake Snider, Logan Wyatt and Justin Lavey all indulged in 3 hit games, with Alex Binelas leading all hitters with a 4 hit performance at the plate. 6 Cardinals had multi-RBI days, with Lavey and Zeke Pinkham both driving in 3 runs. The Cards certainly didn’t do themselves any favors to begin the game. After allowing a solo home run in the opening frame followed by an RBI double from infielder Justin Lavey in the second to tie the game, Kentucky quickly got things rolling. Starting pitcher Luke Smith would give up another home run in the second inning, this time good for two runs. Freshman Jack Perkins would relieve him after Smith would work himself into a base loaded/one out jam, but a walk and wild pitch would make it a 4 run inning for the Wildcats and give the home team a 5-1 advantage in the first 2 innings. The rally would be on from here on out for the Cards, and they did a good job chipping into the Wildcats lead in a timely manner. A third inning 2-spot would cut the lead to just that, thanks to an RBI triple from junior shortstop Tyler Fitzgerald and an RBI groundout from All-American first baseman Logan Wyatt. Fitzgerald’s triple to plate Jake Snider would put the two in a tie for most on the team, with 3 a piece. Collecting 4 RBIs since his return to the starting lineup, sophomore Lucas Dunn continued to deliver in the clutch. With runners on the corners, he would tie the game up in with an RBI double struck deep into the right field gap. In the very next at-bat, junior outfielder Jake Snider would send Dunn home with an RBI base hit of his own and give Louisville their first lead of the game. 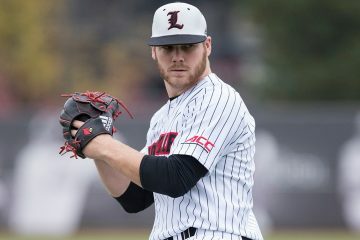 After finally grabbing a hold of the lead in the game in the fourth inning, the Cardinal Nine put their foot on the gas and never looked back. They would plate 12 runs over the next 4 innings, including a pair of 4-spots in the fifth and seventh. Reigning ACC Player of the Week freshman third baseman Alex Binelas and junior second baseman Justin Lavey would both collect RBI singles for their third base hit, with junior outfielder Drew Campbell capping off the fifth with a 2 run home run. 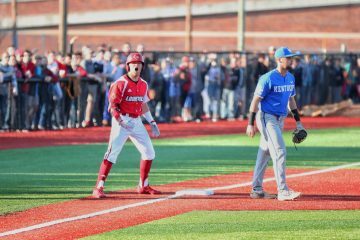 UK would finally put up another run in the bottom of the sixth, but not before senior catcher Zeke Pinkham and Justin Lavey would each register RBI base hits in the top of the inning to make it 11 unanswered runs. 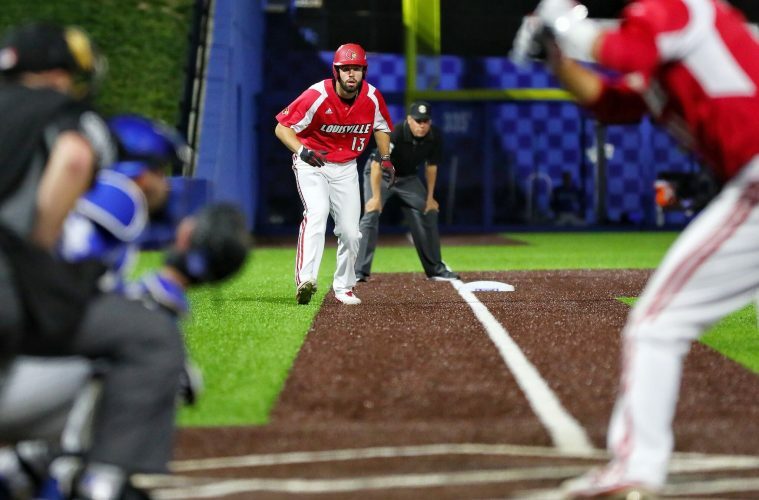 Responding to UK’s sixth inning run would be the latter of UofL’s two 4-run innings, with a pinch hitting sacrifice fly from sophomore Zach Britton and a pair of RBI doubles from Logan Wyatt and Zeke Pinkham in the top of the seventh. Rounding out Louisville’s scoring efforts would be their sixth straight crooked number inning, with a UK throwing error bringing home a run and Alex Binelas logging his 4th hit of the game with an RBI double. 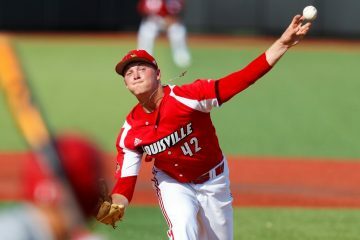 Outside of Luke Smith’s starting outing, the Louisville pitching staff did a fantastic job of keeping UK’s power hitters in check. 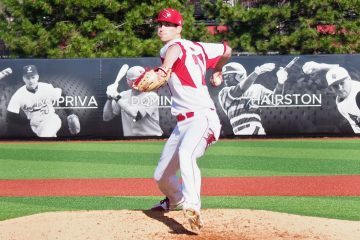 Between freshmen Jack Perkins, Garrett Schmeltz, Jared Poland & Kerry Wright, sophomore Glenn Albanese and junior Shay Smiddy, the bullpen combined for only 1 earned run over 7.2 innings and 8 strikeouts. Smiddy lead the way for all pitchers, with a 4 strikeout performance over just 2.0 innings pitched.